Rob Arnold is the lead guitarist and primary songwriter for the band Chimaira, which is well known in the new wave of American heavy metal bands. 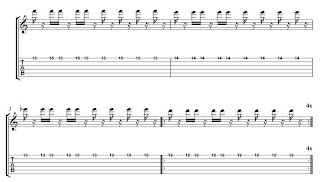 In this lesson, I want to focus on his signature bi-dextral (or two-handed) tapping technique, which is displayed nicely in the song “Empire” from the CD Resurrection. Bi-dextral tapping is when you tap your picking hand on the guitar neck to fret notes in addition to using your fretting hand; the notes are sounded by hammering your finger against the fretboard and pulling off to sound notes with the opposite hand. Arnold has a unique way of applying this technique in a syncopated fashion that locks in with the timing of the rhythm section. This creates a great rhythmic combination and gives a cool embellishing flavor to this song. His inventive way of taking common techniques and finding new ways to employ them is something that all players should bring to their playing. This lesson comes from Rob’s Rock House Method Metal Guitar program. Check out Rob Arnold’s complete Rock House program at www.rockhousemethod.com. Click the guitar tab image to make it bigger and clearer.